Very Edible Gardens PTY LTD (VEG) is a Melbourne (of the Australian persuasion) based permaculture design consultancy, directed by Dan Palmer and Adam Grubb. We were co-founders of the permablitz network, which is a volunteer backyard makeover network, and that’s mostly where we earned our stripes in garden design. As VEG, besides designing, we run workshops, build gardens, and write related books and blogs, do some radio — things you can check out on our sister projects page. In 2006 Dan was a successful academic in philosophy with two book deals and a teaching job in New York. Adam was running the most popular website on the net about global energy depletion. We’d each been raised in families that practised a lot of self-reliance, but in our own ways we’d each lost site of it. Heck, Adam was pretty much half-computer. 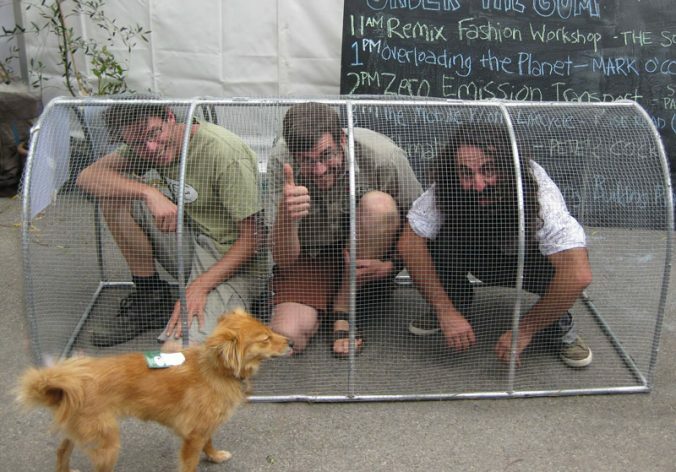 And we each had a desire to be doing something more tangible. Independently we enrolled at a two week Permaculture Design Course with the late permaculture godfather Bill Mollison in 2005. For Adam, permaculture was the perfect antidote to his concerns about a future of less resources. For Dan, it was enough of a kick in the behind to give up his university philosophy job and book deals! 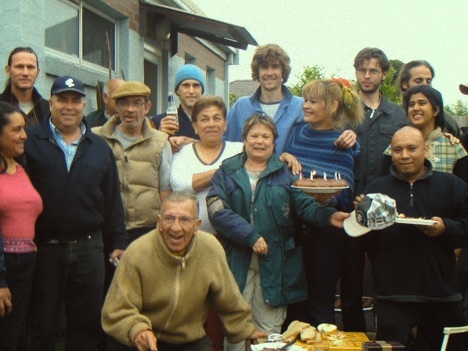 After practising in our own gardens, on an April Sunday in 2006, we got together with a few friends from a South American community group and helped transform our friend Vilma’s backyard into a tasty edible oasis. 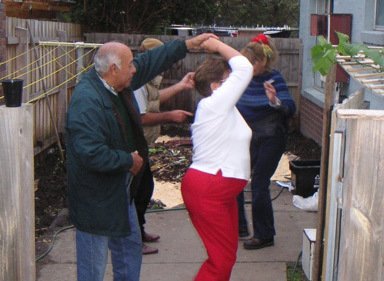 And we danced the salsa. (See the pics!). Others began picking up the concept and there have now been 200 blitzes in Melbourne and the process has gone global. We continue to be involved and the broader network continues to inspire us. The photo above is old. But no, it wasn’t the 1970s. That’s just how Dan’s hair looked in 2006. 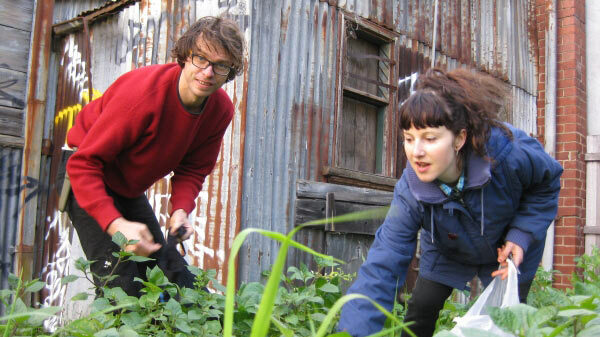 Every blitz has a permaculture design, and that’s how we cut our teeth — as volunteer designers and implementing gardens in the permablitz network. 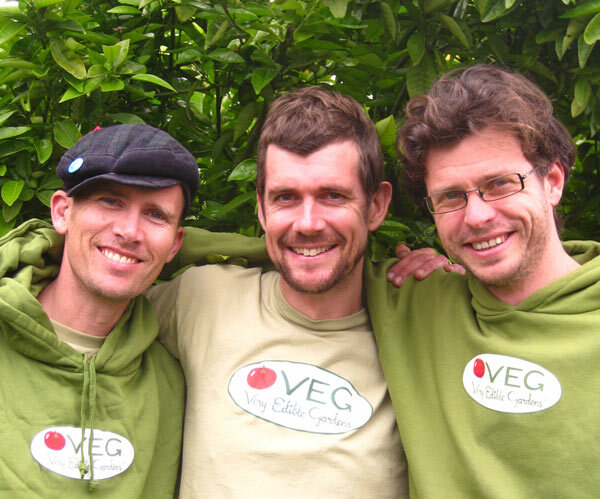 In 2008, we started Very Edible Gardens with our mates Paul Fogarty and Nathan Edwards, so that these things which we loved could become our livelihood too. Paul and Nathe incidentally have both since gone off on their own excellent adventures on permaculture homesteads in the country. Since then we’ve been busy. We’ve worked with, and continued to study with some of the most interesting people in land management. 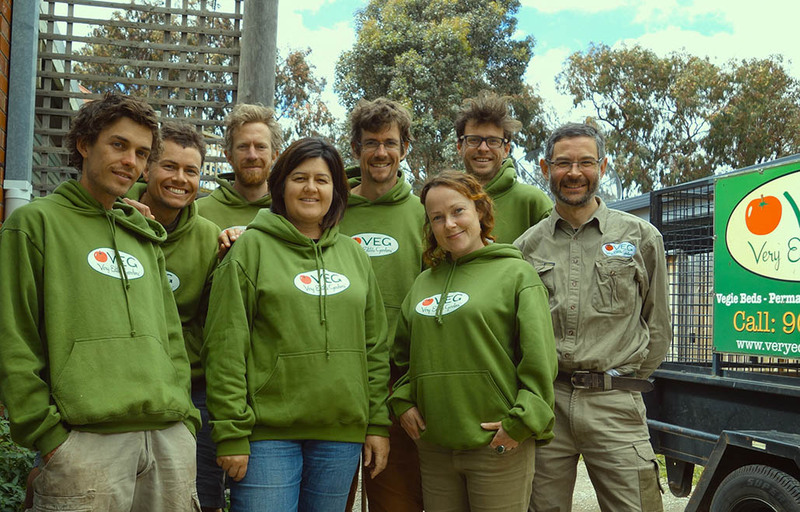 We’ve performed many hundreds of permaculture designs, facilitated hundreds more courses, installed billions of veggie beds and chook systems (ok, that last one is a bit of an exaggeration) and we now work with an outstanding team of legends (OTS). When we’re feeling lyrical, we like to describe the gardens we help create as ‘edible ecosystems‘. We want a world where providing for human needs is not at odds with the planet and its marvellous creatures. Where, when reaching for our food, we’re enmeshed in a system that actually improves ecosystem services. That might make it sound overly grand, and the day to day reality of what we do often involves considering where the kids’ trampoline goes. But life – for both ourselves and the world around us – really can be improved with a bit of design thinking, or just something as simple as a veggie bed. Frankly, this stuff keeps us – on a good day – happy and sane, and helps us maintain some hope for the future. If there are ways we can share, we’re usually glad to. VEG exists to help grow healthy and abundant communities landscapes and livelihoods by designing, creating and educating about regenerative human-supporting ecosystems.